I get a lot of asks for new routing endpoints in Azure IoT Hub, and one of the more common asks is to be able to route directly to Azure Functions. Having the power of serverless compute at your fingertips is very powerful and allows you to do all sorts of amazing things with your IoT data. If you’re looking to do more than that, read on. I have good news and I have bad news. The bad news first: this blog post is not announcing support for Functions as a custom endpoint in IoT Hub (it's on the backlog). The good news is that it's really easy to use an intermediate service to trigger your Azure Function to fire! Let's take the scenario described in the walkthrough, Process IoT Hub device-to-cloud messages using routes. In the article, a device occasionally sends a critical alert message that requires different processing from the telemetry messages, which comprise the bulk of the traffic through IoT Hub. The article routes messages to a Service Bus queue added to the IoT hub as a custom endpoint. When I demo the message routing feature to customers, I use a Logic app to read from the queue and further process messages, but we can just as easily use an Azure Function to run some custom code. I'm going to assume you've already run through the walkthrough and have created a route to a Service Bus queue, but if you want a quick refresher on how to do that you can jump straight to documentation here. This post will be waiting when you get back! Follow the steps to add your Service Bus queue connection information to the function, and you’re done setting up the trigger. Now you can use the power of Azure Functions to trigger your custom message processing code whenever there's a new message on the queue. Service Bus is billed per million operations and it doesn't add an appreciable amount to the cost of your IoT solution. For example, if I send all messages from my 1 unit S1 SKU IoT hub (400k messages/day) through to a function in this manner, I pay less than $0.05 USD for the intermediate queue if I use a Basic SKU queue. I’m not breaking the bank there. 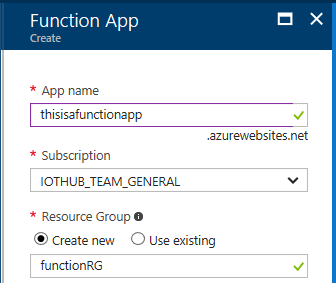 That should tide you over until we have first-class support for routing to Azure Functions in IoT Hub. In the meantime, you can read more about message routes on the developer guide, and learn more about As always, please continue to submit your suggestions through the Azure IoT User Voice forum or join the Azure IoT Advisors Yammer group.